You are here: Home / Latest Articles / OR and Odinism / Criticism or Endorsement of the OR Way? This has been a very good year for the Rite on many levels. There have been too many initiatives and activities conducted this year to list them all here, suffice to say we have advanced in many areas. Our membership has seen steady growth and more importantly the calibre of new members has been high. The Prison Affairs Bureau has gone from strength to strength and it is now fair to say that it is the most vibrant of all the various Odinist/Asatru `outreach` undertakings. In the field of Environmental work we have also had a great advance with actions in Vinland and Europe, which have also drawn positive attention and comment from groups and individuals who would not usually come into the Odinic sphere of action/influence. New Hearths and Hama units have been sanctioned and are operating. There have been various camp/moots both in Vinland and Europe; very good major Midsummer blots, and of course the Great Moot. As well as the continued worldwide OR rituals and the usual blot celebrations. Our web site has remained the premier Odinist website and has added a stand-alone OR Guardian’s web site which deals with Ecological issues etc. and an OR Prison Affairs web site is underway. I could of course go on, but as said, too much has happened to go into great detail here. Suffice it to say, all the advances have been brought about by the dedication, determination and sheer hard work of OR activists. Now it would perhaps be easy to sit back and congratulate ourselves, rest on our hard won laurels as it were, but that is not the way the OR operates. We can of course be pleased and proud of what has been achieved, but we cannot sit back and lap up the accolades. Instead, I have been considering the criticism that the OR and some OR personnel receive. Now we may think it is unfortunate that we attract the criticism of some, but of course it is just a plain fact of life that whatever exists will have critics. When it comes to movements and individuals, it is often those who are most effective or who make the most impact, which draw the most criticism. Naturally as a radical Folkish spiritual movement, we are going to have many opponents and it is understandable that they would criticize and slander us. A revolution with no opposition isn’t a revolution and we seek to bring a spiritual revolution. In fact if our foes didn’t criticize us, I would be rather concerned we were no longer effective. So I am not considering the criticisms levelled by the foe at all. However there are those who, apparently are of the same religion as we are, yet will cast slurs upon us. I want to make it clear I am not talking here of what can be called constructive critique, no, I am talking of criticism intended with malice. Now many of these criticisms are made behind our backs, sneaky little words here and there; indeed I have sat with some of those who make these little comments and while seated with them, they have toasted the Rite to the skies, but once we are no longer face to face, then their words change. And of course e-mail and cyber space offers a whole new realm for those who are bold behind a keyboard. Why do they cast these slurs? Well one can speculate, often it is because we just don’t “play the game”, we don’t join the good ol’ boys club and we don’t play the “Viking warrior fantasy game”. Sometimes it is because of envy and of course sometimes because our outlook and creed is just very different to theirs. However despite the fact the criticisms we are looking at here are made by those with negative intent, still we can consider them on this occasion. In considering these slurs, I made a list of the main ones. There are a few more but mainly they are sub categories of the main ones given here. I have totally ignored the purely personalized ones, as these are not worth anything but derision. The following then is a list of the most common criticisms made about us by others who claim to have the same faith as us (though obviously following different strands). They could be considered as a criticism of the OR Way. I have not listed them in any particular order of prevalence or importance save for the last one as it is often made as a kind of final dig at us. 5. The Odinic Rite is not accountable to others in the “Asatru/heathen” community. These are, as said, the most common criticisms of us I have heard or seen. Now of course in a very real way, when the OR is criticized, it is a personal matter for literally WE are the OR. So a slur against the Rite is a slur against us personally. Naturally we will also have a sense of group loyalty so when our community, the OR, is attacked we understandably can become immediately aggressively defensive and the CG certainly do not condemn any member for conducting a robust and vigorous defence. In fact the fifth of the Nine Charges of Odinism indicates that self-defence is no offence. However it is very often desirable to detach from impetuous emotion and consider things in a detached manner. Emotion can be a product of the small or limited ego and it is this little ego which snares us in illusions. When it comes to criticism, even though the intent of those casting it is negative and based upon their own little ego, we can still rise beyond their level to consider it. Is it justified at all? Is there truth in it and if so, is it in fact really criticism or an endorsement (albeit not intended as that), that what we do is right? If it is justified how can we change this to become better? With that criteria I have considered each of the major criticisms we have been subject to from those who claim adherence to the same faith. 1. The Odinic Rite is Dogmatic. Now this is a very common criticism within the “heathen world” at large. And often it is used by those who do not like the fact that others have a different view or way of doing things than they do. It is often backed up by a reference to Christianity; so for example someone will say “Christianity is dogmatic and we are not Christians, you are being dogmatic so you are like Christians and therefore inferior to me and what I say, so agree with me or you are being dogmatic”. In many cases of course the claim isn’t even explained, it is just used as a knee jerk word which is meant to alarm those on the receiving end. In this it is very much like the term ‘racist’… rarely is it really explained; it’s just a “buzz word”. Well the fact is we DO put forward our opinions firmly and we obviously believe they are true… why on earth would we put forward opinions we didn’t believe were true? It would be utterly pointless to spend time and energy and funds promoting views we didn’t actually believe, so it seems those who make this criticism find it to be a fault to actually promote what you believe. Unless they are hypocrites it must also mean they don’t do this themselves, so presumably they don’t really believe what they say? It’s a bizarre criticism when you consider it and I don’t think it is one we should take offence at, for the fact is we will continue to firmly put forward our beliefs. Now we don’t say everyone has to believe them, we don’t say if you don’t believe us you will be punished etc. But we do say “this is what we believe, if you agree join us, if you don’t agree fine, we don’t really care”. So as a barb against us criticism number one is blunt and useless and in fact those of intelligence can see that really, no matter how it was intended, it is an endorsement of OR policy; that is, we say what we believe is true and we will do so firmly. 2. The Odinic Rite is Elitist. Now we are often regarded as an elite in the general “heathen world” and at this point in our existence, we are. Not because we say we are; after all, anyone can say anything they choose, each of us could claim to be the King of China; of course it would not be true but we could claim it. No, we are not elite because we say we are or because we want to be, we are elite because we do not rest on our reputation, we continually seek to advance onwards and upwards. We do put our words into action and don’t just flap our gums spouting what sounds so noble and honourable, but in reality doing nothing but blow hot air. Nor do I say we are elite from a natural bias I have for the Rite. Indeed when we have slipped I have acknowledged that. As an example, right now our website is the premier Odinist website on the entire web, the elite of the Odinist web sites as it were. But it wasn’t always so, at one point its standard fell until I actually winced when I saw it, it was dull and frankly embarrassing. At that time the Rite itself was beset by all manner of storm, in short we were not what I would consider to be elite at all. So what did we do? We strived to improve; we considered the steps we needed to take and took them. We cut away the deadwood, we tightened up membership procedure, we used the talents of our members to improve and by their hard work and the inspiration of the High Gods, improve we did to the point we once again have taken our place of honour as the Vanguard of the Odinic New Awakening. It is again a rather bizarre criticism; of course we strive to advance, to do the best we can. Why is that considered to be a fault? Presumably those who call us elitist as an insult strive to be mediocre? Or don’t strive at all? And if that’s what they want to do, fine, but we do want to constantly improve so we remain the most effective vehicle to bring the beauty, joy and magnificence of Odinism to our folk. I don’t think we can therefore take this claim that we are elitist as an insult; in fact it is an honour and something we should continually strive to be. Another endorsement for us then and not something we see as critical at all. 3 The Odinic Rite is too radical. Well to be candid I am not entirely sure what was meant by this, as there were few specifics along with this claim. One was that “the OR rocks the boat too much”. What boat were they referring to I wonder? If it is the general boat of how modern society is going, then I have to say it is not true to say that we want to rock that boat; no we don’t want to rock it, we want to sink it. But we have our own ships standing by for those who wish to come aboard. But again, it is such a vague criticism, that it is basically meaningless. It should be stated though that the OR is a radical organization. It may be strange that striving for our own Faith and Folk is radical, but such is the nature of current society that indeed that is the case. So this again has to fall in the category of endorsement. Well this of course is again totally vague. I enquired delicately about this and it seemed to refer to the fact that we do not hold the Viking age to be the be all and end all of Odinism. There have been many articles in OR publications explaining our position on this point, so I do not need to explain our view again. Neither do we pore over books to try to find what is the “lore” and then chain ourselves to it. For us the importance of the “lore” is not the transient but the transcendental. There is much of the so called Lore, which relates purely to the time it was written in, and while it may be interesting to learn of it, it often has no relevance to any other time period, either prior or later. The inner wisdoms are those we seek and pay heed to. Now if this makes us unorthodox, well then we are. But as we are extremely influential, is this really a criticism of us? As we have seen, even organizations and individuals who don’t actually like us are often influenced by us. 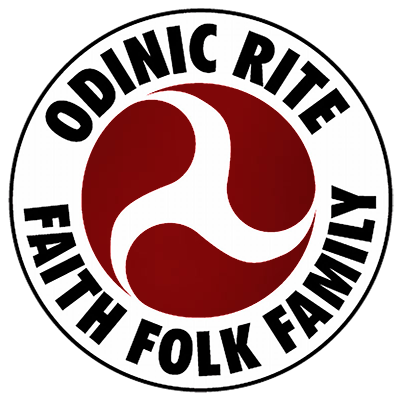 As just one (of many) examples, I can think of one, which seems to constantly follow our footsteps and then try to reinvent the wheel in their own name, even down to designing a logo, which would seem clearly intended to look similar to the Odinic Rite’s. I suppose imitation is a form of flattery, but imitations are never as good as the real thing and tend to come undone and fade. However, we should feel pleased that we do influence others. I think then we can notch this one up as another endorsement. Now in many ways this one really does take the cake for sheer hubris. After slagging us off, listing all these things which are supposedly bad about us, these critics then have the bloated sense of self-importance to imagine that somehow we should be accountable to them. Really it is either incredible ignorance or incredible arrogance which would prompt these detractors to imagine we owe them anything or should in anyway at all be accountable to them. The Odinic Rite is not accountable to any but our Gods and ourselves. It is us, the members of the OR who are the OR so each member is accountable to the Rite as it were, and the Rite is accountable to the members. We are accountable to our Gods and each other, and that is it. We don’t expect any other group to be accountable to us, we aren’t even interested in them enough to want that to be the case, so why those who clearly don’t like us should imagine we should be accountable to them, and then whine and bleat because we are not, is baffling. So we can’t really count this as criticism either, it’s a statement of fact and it is a fact that will not be changing. We can therefore chalk this up as an endorsement also. Well then, after careful consideration, I think we can see that no matter how intended, each of these supposed criticisms is in fact an endorsement that the OR Way is a good way. It suits us fine and as the oldest continually active Odinist movement in Vinland (by more than a decade) and arguably the oldest established active Odinist movement in Europe, we must be doing something right. Well, though this article is written with a fair amount of humour, we can realize that considering others criticism can actually be quite rewarding. https://i2.wp.com/odinic-rite.org/main/wp-content/uploads/IMG_5731-e1551229178695.jpg?fit=893%2C450&ssl=1 450 893 Hengest http://odinic-rite.org/main/wp-content/uploads/2016/05/or-badge400-transp.png Hengest2010-11-30 01:45:182019-02-27 01:07:35Criticism or Endorsement of the OR Way? Rites of Passage: Initiation as a Developmental Tool Attracting Women to the Rite – Some considerations.